It’s football season and one thing is clear: Where there is a game, there is food! A simple, rather typical staple in football tailgating (and any football party) is a classic bag of Ruffles with the infamous onion dip! Personally, I am not a dip fanatic. My husband, on the other hand, is. 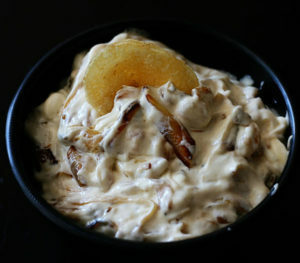 This version of French Onion Dip will forever be on my countertops during game day! It is thick, velvety, full of fresh onion chunks, and has a hearty beef flavor! Now, I can’t take credit for this delicious recipe because it belongs to Sandy Zimmerman, an amazing friend and fellow foodie! However, when she put this bowl of happiness in front of me, I knew I had to make it and, of course, share it! She is the type of woman that thinks outside the box; in this case, literally. Instead of your typical boxed onion dip mix, she whipped this together in just a few minutes. So, I tried it myself, and it was a hit in our home. Hope you enjoy! Heat a large skillet over medium-high heat. Combine butter and olive oil, and heat until butter has melted. Add the sliced onions, and sauté until soft and translucent. Stir in the bouillon base and 4 tbsp of water, mixing well. Cook over low heat for another 5 minutes. Remove from heat. In a large bowl, pour the warm onion mix into the sour cream and stir thoroughly. Refrigerate for at least 25 minutes. Welcome to Dip Heaven! Enjoy! Skip the store-bought dip and whip up your own thick, fresh, chunky French Onion dip in just a few minutes! Combine butter and olive oil, and heat until butter has melted. Add the sliced onions, and sauté until soft and translucent. Stir in the bouillon base and 4 tbsp of water, mixing well. Cook over low heat for another 5 minutes. Remove from heat. In a large bowl, pour the warm onion mix into the sour cream and stir thoroughly. Refrigerate for at least 25 minutes.